Cache Creek, BC. Cache Creek, British Columbia. Part of the BC Adventure Network. Over a million web site visitors annually ! There have been a number of popular stories of how this town got its unique name. Some have told tales of gold miners caching or hiding provisions there, others have recounted mysteries of murder and hidden gold but the most recent theory is that this was a collection site for furs travelling east and the fur traders cached or stored them here. 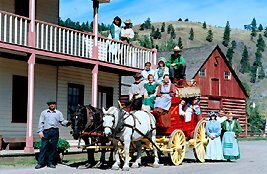 True to its name the town of Cache Creek is steeped in Cariboo History and is located on the old Cariboo Wagon Road. This popular spot was a stopping place for miners gathering supplies before heading farther north to the gold fields. Just north of town is the Hat Creek Ranch , open to the public May to October, which housed weary travellers and their animals. For those more interested in modern day technology, there is a race car track south of town which hosts a variety of races for competitors from as far away as the States and eastern Canada. 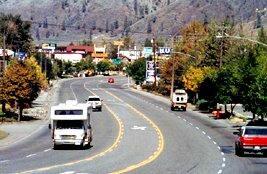 With many facilities and points of interest, Cache Creek is now a popular stopping place for the modern traveller. Access: Cache Creek can be reached from the south, north and east by car or bus. It is located at the junction of Highway 97 and the Trans Canada Highway. The Trans Canada Highway (Highway 1) winds its way north from Vancouver to Cache Creek where it veers east and heads to Kamloops, while Highway 97 takes travellers on to northern B.C. and the Yukon. Visitors with private planes can take advantage the small 3280 ft. asphalt airstrip located just south of town. Climate: Hot, semi-desert climate with sagebrush and bunchgrass covering the rolling hills. Industry: Agriculture, tourism, mining and waste management, film industry. Historic Hat Creek Ranch - displays depict the history of the area and also the Natives of the area. Graffiti Days is an annual event held the second weekend in June in conjunction with the Old Time Drags at the Eagle Motorplex. Cars 1970 and older fill the village for this 1950's theme weekend, which includes a Parade, Show & Shine, BBQ, and dance. There is also a Canada Day celebration in July.